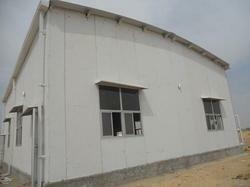 Manufacturer and Supplier of PUF Panels Cold Storage. Our product range also comprises of Aluminium Ladders, Polycarbonate Canopy and Fall Ceilings. We feel immensely pleased to offer an extensive gamut of PUF Panels Cold Storage. Our offered panels are manufactured by utilizing optimum quality raw material and advanced technology by our skilled professionals. In order to ensure quality, the provided panels are rigorously tested on various parameters by our quality experts.